CRONOS is the exception - in that superlatives fall far short of defining what she offers a cruising family.Designed, built, executed and maintained by an exceptional cruising couple with the means, knowledge and time to create the ultimate owner-operated offshore-capable cruising vessel. Twin Caterpillar C-18 A-cert A-rated engines with 1150 hp each give CRONOS the ability to top twenty knots (if one is in a rush to beat weather, currents or life’s situations). She also has the fuel efficiency to complete an offshore run from Jupiter, FL to Stamford, CT non-stop in 76 hours. Fuel capacity is 2800 gallons, giving you 1,250 miles of range at 10 kts with 10% reserve. Top cruise 19 kts at 80% load, with a top speed of 21.5 kts. During the build, CRONOS’ owners were onboard for weeks at a time at the GB factory supervising every aspect of the construction, working with an exclusive team of architects and engineers at Grand Banks. This was not a production-level GB 72...only the very top-level craftsmen were let onboard to execute their various tasks. Right down to the electricians, plumbers, carpenters and varnishers: only the very best craftsmen in the factory were allowed to become part of the build. That same exacting standard has been brought to the maintenance program, with a nearly unattainable level of attention to detail.Simply put, I cannot overstate the level of attention and the thorough nature of the maintenance program. All systems onboard are currently flawless. Every aspect of CRONOS’ layout was custom designed to maximize efficiency and use of space to translate to luxury within the 72 foot size envelope. There is an extremely nice captain's quarters with private access for deliveries and longer runs which may require assistance. The master has a king-size berth with his and hers heads connected by a full-size shower with 60-PSI water pressure. The salon boasts an ingenious formal dining table layout. 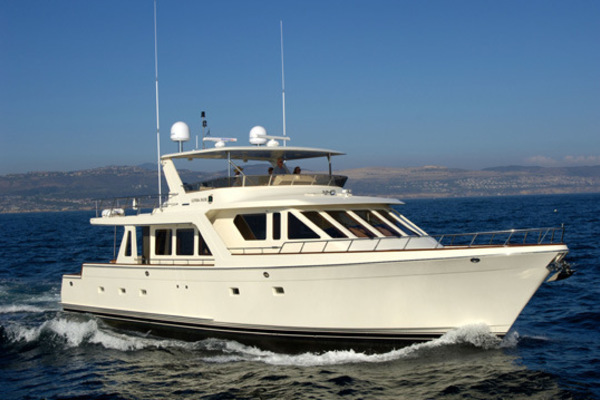 The pilothouse has a gourmet chef's galley and a rider bench with fold-out table for friends, family or crew. The bridge has twin grills, additional icemaker and a very open social seating layout. These are just a few of the highlights which embody the special nature of this offering. CRONOS has taken her owners as far North as Nova Scotia and as far South as Turks & Caicos - and is regularly seen prowling the far Bahamas; yet she was still just as comfortable hosting the race committee for the historic J boat races off of Newport, RI last summer.Designed to run by owner-operator or by captain/crew - enough space for support but manageable enough for two people. More than 200 professional photographs are available upon request. Reasonable trade-in vessels will be considered. United Yacht Sales New Jersey would love to guide you through a personal showing of this 72' Grand Banks 72 Aleutian Rp 2016. This yacht for sale is located in Stamford, Connecticut and priced at $4,299,000. For a showing please contact us by filling out the form on this page and we will get back to you shortly! Stepping onboard CRONOS, it is obvious that a yachting etiquette has been ardently adhered to without exception. Teak decking in the cockpit and on the swim platform. Mega-yacht style staple railing on the swim platform as well as deploy-able swim ladder. Twin and comfortable staircases and doorways from the swim platform to the covered aft cockpit. Large inch and a half thick bullnose varnished teak table in front of the large forward facing settee supported by mega-yacht style stainless steel legs. OpacMare double sliding doors lead into the salon. The salon sole is solid teak planking surrounded by an accent of holly all around the exterior edge of the sole. All the cabinetry are solid teak and of a traditional raised panel design. All catches are dead bolt style for safety. There are two end table cabinets at the far aft portion of the salon both to port and starboard designed to house important items which are either commonly needed or to be accessed quickly from either inside or out. The salon has a large L-shaped settee stretching along most of the starboard side of the salon covered in cream colored leather. There are two cabinet style move-able coffee tables and two swiveling barrel chairs stationed opposite to port. The entertainment center is custom built onto the port side and is of a portion of an octagon in shape. The majority of the sole is protected by a custom cut matching cream colored carpet. Forward in the salon is the formal dining area with another generous L-shaped settee (matching leather) complimented by two custom dining chairs in teak and leather. The dining table is of a similar design to the cockpit table but only slightly more formal. Opposite the dining to starboard is a bar and china storage cabinet as well as the main electric panels and service. Forward of the dining area is a custom display cabinet as well as storage and stereo equipment. Up three short steps to the galley one is greeted by a near surround of glass and an open flowing feeling to the space. The galley is immediately to port with four burner electric stove, convection microwave, trash compactor and a compliment of six (6) SubZero fridges or freezers to say nothing of the abundance of storage for a boat with this type of offshore cruising capability. Directly forward of the galley is the first mate's bench facing forward and set at helmseat height. Easily large enough for three additional people to assist the captain in keeping a safe passage. There is also a custom table here with a design complementary to the others for light dining and navigation. The Helm is on center with a double Stidd helm chair as well as the full package of electronics listed in the body of the listing. There are port and starboard submarine style doors to quickly access the side decks and the curved companionway leads below from the starboard forward corner of the pilothouse. Arriving below decks there is a landing and companionway leading forward and aft to the various cabins. The separate washing machine and dryer are ingeniously tucked into a space under the companionway but inside the day head. As you walk further aft you enter the master. The spaces were painstakingly poured over with the desire to maximize efficiency while still delivering an aesthetic design. The goal was achieved with aplomb as the spaces flow effortlessly and yet, upon close inspection, there is tremendous utility and storage. There are private his and her mirrored heads to port and starboard of the king-size master berth with custom curved cabinetry, surrounding marble counters and high-end fixtures. The shower is glass and on centerline and of generous proportions. There is a large, well organized walk-in closet to starboard as well as a settee bench and portlights both port and starboard for natural light to enter. The television is mounted on the forward bulkhead. In the bow is the VIP and it easily rivals the comforts of most of our competitors master cabins. Queen-size berth, hanging lockers, shelves, cabinets and television as well as en suite head...this is a very well executed portion of the design of this 72. Between the two cabins is the third stateroom. This was designed with twin berths in order to maximize flexibility in handling family and crew. The berths and storage work beautifully here as would be expected. In going back up the stairs there is a second curved companionway going upwards from the pilothouse on the aft starboard section. Once you gracefully arrive up on the bridge through the polished stainless steel hatch,you are immediately aware that this is more than just a running bridge and dinghy storage. The helm station is on centerline with a generous amount of space for the dashboard electronics to be laid out in a clean and well-proportioned manner. The helm seat is again a double Stidd helm. There are two large L-shaped settees facing two yacht style tables with an egress down the centerline. This entire space is underneath the lighted hardtop and crystal clear three sided enclosure. Walking aft there is a banquette with the two Miele grills and a beverage fridge. The davit style crane easily deploys the sport boat style inflatable dinghy in a matter of a couple minutes. There is a direct access staircase to the cockpit which, like the stairs to the pilothouse, are easily navigated walking style rather than having any sort of a ladder feel to the egress. The entire space of the bridge is generous and quite open. There is plenty of room for future installation of more storage of gear, or as it is currently configured there is just a great feeling of openness and space for entertaining. The non-skid surfaces on the bridge are finished in traditional “Moondust” colored Awlgrip. Whether the plan is to entertain a large group or just to get a quiet moment with a book and a penthouse view of the harbor…CRONOS' bridge is a major asset to an owner’s time onboard. The broad shouldered walking side decks are also finished in Awlgrip non-skid in the forward areas of the boat. As you come to the Portuguese bridge, take the time to notice the thoughtful and surprisingly large amount of space for storage which was designed into this portion of the deck. It is these thoughtful details which time and again set CRONOS apart from the average cruiser. Going through the centerline double wing doors to the foredeck, one is flanked by two double custom L-shaped settees which face forward for the breeze. Again the deck is open with dorade vents set up for the forward areas of the boat as well as oversized cleats and chocks. There are two large lockers for dock line and fender storage mirroring the sides of the windlass. The pulpit was designed with enough space to handle two meaningful sized anchors with dedicated storage for the two sets of chain. Turning around here do not miss the electronics antenna layout up on the hardtop and pilothouse visor. Once again it is the subtle details of the function complimenting the aesthetic form and balance that make CRONOS so special. Just some general notes on CRONOS...She was built with all fully hand varnished teak bulkheads instead of the less expensive vinyl which has become the norm. The potable water system was upgraded to 22ml 3/4 inch household level plumbing driven by 60 psi for water pressure with a back-up. All of the closets were built with accessible screws for the hull side panel for easy access for future technicians to trouble shoot...there are no inaccessible areas of the boat. All of the furniture was stick built to maximize the potential envelope for storage. There is a single stand alone 9kW air conditioning unit dedicated to the master so that at anchor when hot one can leave that sole A/C unit on off of the inverter all night and one does not have to run the generator. Spare pre-cut hoses for all of the engine plumbing. All the below decks hatches were cut without the finger rings so no stubbed toes and a cleaner appearance. All the under sole areas were set with lighting and teak grate flooring so that they can be used effectively as storage. The crane is set on centerline aft so that one can launch the dinghy all three sides. Custom overhead folding dish lockers to maximize the view as well as the storage for the galley. There is a magic corner storage unit in the galley. Ocean Air blinds throughout the upper decks. Canvas covers for all exterior including the toe railings. Bow and stern shorepower. With the deep freeze in the captain's quarters there is enough food storage for six people to travel independently for three weeks of course supported by the 1800 gallon watermaker; the fresh water is essentially unlimited. Literally there are spares for EVERYTHING. The owners of CRONOS worked tirelessly to create a tremendous cruising platform...the buyer of CRONOS gets the benefit of all of that effort in the form of extremely reliable cruising well into the distant future. Exterior teak cleaned gently, no sanding or oil. Freshwater hose frequently.